First there was a mission. Then there was a district. Then came a conference. The three step process took a very short time. Robert Alexander, the first of the missionaries, arrived in Sept. 1837, and the conference was organized in December, 1840. From December 1840 until that organization, most Texas Methodist churches were in the Texas District of the Mississippi Conference. Circuits in northeastern Texas were part of the Arkansas Conference until 1844 when they were incorporated into the newly-created Eastern Texas Conference. There was one name conspicuously absent from the appointments—Llewlyn Campbell who had been preaching in Texas for most of the second half of 1838. It was Campbell, for example, who performed the wedding ceremony for Littleton Fowler and Missouri Porter in June, 1838, in Nacogdoches. Campbell was appointed to New Orleans instead of a Texas circuit. He and Fowler were both deeply disappointed, but accepted the appointment . It is true that New Orleans needed a strong Methodist preacher, but Campbell’s appointment had a negative effect on recruitment of more volunteers for Texas. Before 1838 a preacher in the United States could volunteer for the Texas Mission through the Mission Board. From December 1838 until December 1840 the volunteer had to transfer to the Mississippi Conference and then hope for a Texas appointment. Distance was also a problem for the Texas District. In brief, sessions of the Mississippi Anual Conference were simply too far away so that few Texas preachers ever attended. The creation of the Texas Annual Conference had to wait until the 1840 General Conference of the MEC authorized such action. The Texas District of the Mississippi Conference existed only two years. The 1923 session of the Texas Annual Conference that met in Cameron from November 21-25 is a special one in our family heritage. It was at that session that the author’s grandfather, the Rev. Wesley William Hardt, was admitted into full membership and appointed to Hemphill and Bronson. W. W. Hardt was born in 1895 in Medina County; graduated from Yancey High School, and while in his senior year at Southwestern University was appointed to the Bogata Circuit in Red River County in the North Texas Conference. After riding that circuit in the spring 1919, he came back to Georgetown where he was awarded his SU degree in June. As the fall 1919 annual conference sessions approached, he attended the Texas Annual Conference held at Marvin, Tyler, and was appointed to the Keltys Circuit for 1919-1920. While serving Keltys, he married the former Ida Lenora Wilson, also of Medina County. At the next annual conference (1920) held in Houston, he was appointed to Sugarland-Missouri City. In 1921 the Annual Conference was held at Beaumont, and Hardt received his deacon’s orders. Having served the requisite period on trial, he was ready to receive his elder’s orders at the 1923 Annual Conference. He rode the train from his appointment to Houston where his friend, William C. Martin (later bishop) was pastor of Grace MECS in the Heights. The two young men shared the rail journey to Cameron where Bishop John M. Moore ordained both of them elders in the Texas Annual Conference. Annual Conference Sessions of the era moved from city to city, and one of the advantages of Cameron was its rail connections. Those connections allowed visitors from beyond the conference to attend the 1923 session. The presiding bishop was John M. Moore, but Bishops Hay and McMurry also attended. Also in attendance were denominational officials such as Paul Kern and C. C. Selecman from SMU (Dean of Theology and President respectively both later elected bishops), the Barcus’s (John, Sam, and E. R. from the Central, North Texas, and Northwest Texas Conferences), and Atticus Webb of the Anti-Saloon League. Methodist publishing was riding a high tide in 1923, and editors A. J. Weeks of the Missionary Voice and P. E. Riley of the Texas Christian Advocate came, along with W. C. Everett, manager of the Publishing House in Dallas. The Texas Conference in 1923 was still experiencing the Progressive Era enthusiasm for missions and was in the process of strengthening the institutions designed to support mission endeavors. The Conference had only recently assumed ownership of the Methodist Hospital in Houston. It also supported a Port Ministry at Galveston and dormitories for women at state universities. One would think that with the success of the campaign for national prohibition of alcoholic beverages, that fight would be over, but the battle continued against bootleggers and intemperance. The Conference was especially proud of its schools and universities. SMU was less than a decade old, but was already the most prominent MECS institution in the entire region. The Annual Conference was delighted to hear the report that the Kirby family of Austin had recently donated funds for the construction of a theological building at the Dallas campus. Yes, the 1923 session of the Texas Conference of the MECS was a memorable one for many reasons, not the least of which was the granting of elder’s orders to my grandfather. The great evangelist of early Texas, Henry Stephenson, finished his earthly life in Jasper on November 20, 1841. 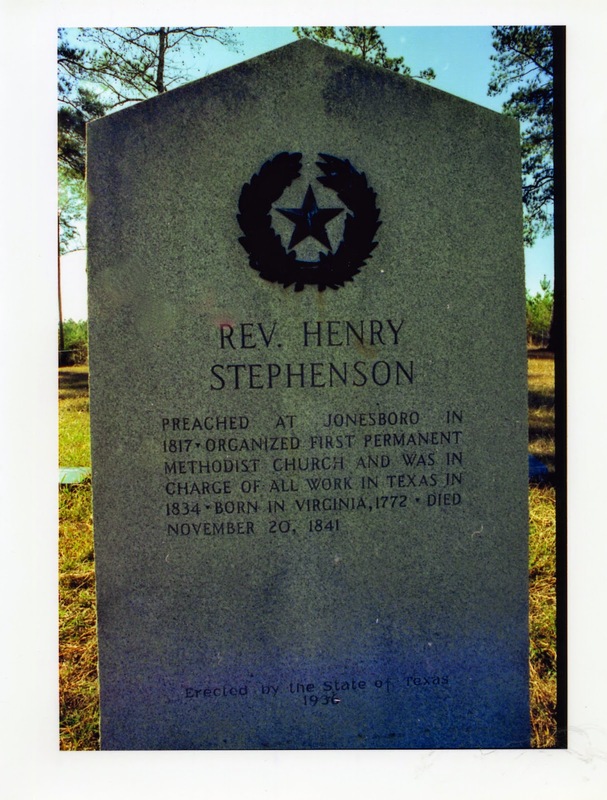 Stephenson was force in Texas Methodism from as early as 1817 when he preached near Jonesboro on the Red River. He visited Austin’s Colony several times, the first in 1824. In 1834 while living in western Louisiana, he was instructed to spend half his time in Texas. That assignment led to the organization of McMahan’s Chapel, the oldest continuously operating Methodist congregation in Texas. Stephenson was born in Virginia in 1872. His family moved to Kentucky and then Missouri. In 1812 Henry Stephenson was licensed to preach in Missouri. He then moved to Hempstead, Arkansas, in the southwestern corner of the territory. It was from that location that he preached in the Red River country. He later moved to Louisiana, and then after Texas independence to Cow Creek in what is today Newton County. From that home base he preached in both Jefferson and Jasper Counties in 1840 and 1841. Mr. Stephenson’s mental endowments were not extraordinary; his education was very limited. He married young and raised a large family. His whole life was spent upon the frontier, amid its perils and privations, and yet he accomplished an immense amount of good. He preached along the whole western boundary of settlements from the Missouri River to the Colorado, and left a name which is an ointment poured forth through all this vast region. It is hard to fathom the secret of his success. He was neither learned nor eloquent in the ordinary acceptance of the terms, but he was a good man and cherished a single purpose to glorify God, and do all the good in his power. He was of a meek and quiet spirit, winning friends by his gentle manners. In one respect nature had favored him. He possessed a most musical voice, a voice ringing out on a campground charmed into silent and attentive listeners all classes of people. The memorial was erected at his grave by the Texas Centennial Commission in 1936. photo credit; Roland T. (Bill) Scales. Most readers of this column are aware of the great hurricane 1900 that destroyed Galveston and much of the rest of coastal Texas on September 6-8. At the time Galveston was the premier port in the western Gulf of Mexico with a large concentration of financial, insurance, wholesaling, and transportation businesses. It was a modern city with telephone lines, urban transport, beautiful homes, and strong churches. The devastation can hardly be overstated. For many years the death toll has been pegged at 6,000, but an accurate number in such a disaster will probably never be known. Many images of destroyed buildings, beached vessels, twisted rail road track and other scenes continue to fascinate us. There were two MECS churches in Galveston in September, St. John’s and St. James. St. John’s was located at the corner of 25th and Broadway had been dedicated in 1871. It was brick Gothic design with a bell tower, pipe organ, and hand-carved black walnut pews. It had two stories and was about 55 x 100 feet. It was destroyed. St. James was founded about the same time as a mission and became a full church. It was not destroyed but did sustain some damage. For those of you who have served on church building committees where time seems to be measured in years rather than weeks, what happened right after the hurricane is really remarkable. Exactly two months after the hurricane, on November 9, 1900, the combined members of the two churches purchased lots at the corner of Ave. I and 19th Street for $9750 for a new church building that would unite the two congregations. Remember that church members were grieving, rebuilding, restoring, and continuing to cope with the aftermath of the largest single natural disaster in American history. The fact that they found time to plan for a new church so soon speaks volumes for their dedication. The preacher who led the combined effort was Seth Ward, elected bishop in 1906. The Church Extension Board of the MECS provided construction funds, as did sympathetic Christians from all around the country. The result was a new church, now named Central Methodist (later changed to First Methodist) MECS of Galveston. That Spanish-styled church building served the congregation until February 1964. The congregation then moved to a new church in a new location with a new name—Moody Memorial Methodist (today United Methodist) church. By November 1864 the misery, death, and destruction of the Civil War continued to touch every community in Texas. Although few military engagements had been fought on Texas soil, every community was touched by the death and dismemberment of family members, conscription of men, animals, and supplies, inflation, scarcity, and other miseries of war. The Texas Annual Conference of the MECS convened in the Baptist Church of Waco on November 2, 1864. It was the third conference session at which no bishop came to preside. Conference members elected Robert Alexander to preside, but even he, the last survivor of the first three missionaries in 1837 could do little in the face of the difficulties the church faced. Here were some of the problems the church faced. a. many of the preachers had enlisted in Confederate units as either chaplains or combatants. Most notable were Colonel Franklin C. Wilkes of the 24th Texas Cavalry, Colonel George W. Carter of the 21st Texas Cavalry, and Colonel Clayton Gillespie of the 25th Texas Cavalry, all of whom held military commissions but also some of the best appointments in Texas Methodism. They could not be replaced through ordinary means since only a bishop can ordain a preacher, and no bishops had been to Texas since 1861.
b. The economy was in shambles. Methodists made extraordinary efforts to support missionary efforts—which in 1864 meant the military chaplaincy, but most members had near-worthless Confederate notes rather than hard currency. In 1864, for example, the missionary treasurer of the Texas Conference reported donations and expenditures in specie (metal money) and “Old” Confederate notes, and “New” Confederate notes. The Treasurer reported $55,000 in currency and $297 in specie. c. Methodist publishing had ceased. Before the war the Texas Christian Advocate was one of the most widely distributed newspapers in Texas. At the beginning of the war, they closed their offices in Galveston, David Ayres—the financial agent—moved to Gonzales, and the paper tried to set up shop in Houston. The Union blockade made ink and paper very scarce commodities, and the inefficient, haphazard Confederate Postal Department made delivery difficult anyway. The preachers at the Annual Conference also called for the other two conferences in Texas, the East Texas and Rio Grande, to send delegates to Houston in December 1864 for sort of a regional General Conference. Episcopal visits had been the glue that held the denomination together. They hadn’t had one for three years. Both the Advocate and the call for a conference speak to the fervor for connectionalism that characterized Texas Methodism in the 19th century.